You are here: Home / News / Thank God Mr. Ted Cruz is in Washington. Thank God Mr. Ted Cruz is in Washington. Before I go on, I wish to address a guy whom I will call Ned. Whenever I praise a conservative, Ned emails to correct me, claiming the conservative is a deceitful traitor. When I share reasons for optimism, Ned vehemently disagrees, even seeming a bit angry that I would think our efforts could possibly make a difference in America’s corrupt political environment. Ned always sees the glass less than half empty. I guess we need people like Ned to keep us balanced. Although, I am not quite sure about that. Sure enough, in response to patriots’ giving Ted Cruz rave reviews for speaking truth to Washington power, Ned ripped into Cruz about questionable votes. Folks, I realize Ted Cruz is not perfect. But then, which presidential candidate is? Jesus is not running for president in 2016. As a member of the Tea Party since it began, Cruz going down the list of GOP betrayals brought back memories. Remember how we fought and worked our butts off to give the GOP the House, then the Senate? We worked to elect Republicans to stop Obama from rolling out the welcome mat to illegals. Over a million of us showed up in DC to protest Obamacare. I thought of all the travel miles, funds, blood, sweat and tears sacrificed by Tea Party Americans; patriots who simply want lawful Constitutional government. I thought about how Obama sent out his liberal mainstream media air force to bomb us with accusations of racism against the first black president; hoping to soften and diminish our ranks. The Tea Party is not racist, nor do we hate anybody. In his speech, Ted Cruz did two things that were quite remarkable. First – Cruz exposed the good-cop, bad-cop personal and corporate enrichment scam both parties have been playing on the American people. Second – Cruz spoke with unprecedented clarity. He did not say McConnell misspoke or McConnell was disingenuous. Cruz said McConnell lied. It was refreshing that when pressed by the liberal bias media, Cruz refused to jump on the destroy Donald Trump bandwagon. 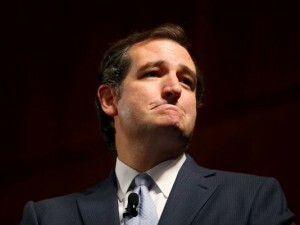 This tells me that Cruz has backbone and will not automatically play by the Left’s rules of engagement. It is fair game for GOP presidential contenders to express their disapproval of Trump’s style and tactics. However, when a GOP presidential contender joins the MSM in its evil attempt to brand Trump a racist for simply addressing illegal immigration, red flags go up regarding the character of that contender. It tells me the contender will say whatever necessary to win. I call that “soulless” politicking. Such behavior has the awful stench of what happened in Mississippi. In the primary, Republican Thad Cochran’s camp joined Democrats in branding the Tea Party racist. To beat the Tea Party conservative, Cochran’s people despicably made lying phone calls to black voters saying the Tea Party candidate would turn back the clock on racial progress. This is the kind of deplorable evil divisive totally self-serving politicking Cruz exposes in his book. The GOP presidential field is rich with honorable contenders. I ask myself the following question. When I lay my head on my pillow at night which candidate winning the WH will cause me to sleep the most peacefully? Who is most likely to remain true to their promises to We the People; fight to repeal Obamacare, end the invasion of our borders, defend life and traditional values? Who believes in Conservatism enough to throw a lifeline of inspiration to those drowning in the treacherous deep dark sea of Obama’s welfare state America? Who will pray as the song says, “Lord lift us up where we belong” as Americans? Currently, I believe that candidate is Sen Ted Cruz. Chairman of The Campaign to Defeat Barack Obama. Please help me spread my message by joining my Liberty Network. Lloyd is singer/songwriter of the American Tea Party Anthem and author of Confessions of a Black Conservative, foreword by Michele Malkin. Truth is, the tea Baggers and Rethuglicans are in turmoil at this time and are imploding. I love sitting back watching this entire scenario. God is exposing you all for what you really are…HYPOCRITES and you will not shame God nor His church. A lost hypocritical soul. Stockholme Syndrome really sucked you in. Prayers needed badly.